A tiny frequency converter has been developed by researchers at the National Institute of Standards and Technology (NIST) using a technique similar to the computer chip fabrication method. The study results have been reported in the Nature Photonics journal. Photons are light particles, and quantum communications exploits the delicate relationships between the subatomic properties of these light particles for highly secure data transmission and storage. For this purpose, it is essential to shift the color or frequency of a photon to another. The new nanoscale optical frequency converter holds potential to enhance the security and extend the distance of operation of next-generation quantum communication systems. It is possible to customize the tiny device for a range of applications as it can be easily integrated into other information-processing components. It is also viable for mass production. The newly developed device enables the efficient conversion of photons between two frequencies with low power consumption and very low noise level, which means the background light is not related to the incoming signal. Frequency converters are required to address two problems. The frequencies that are typically required by the quantum systems for optimally generating and storing the data are higher than the frequencies required to transmit the data over kilometer-scale distances via optical fibers. A shift of hundreds of terahertz is required to convert the photons between these frequencies. One terahertz represents a trillion wave cycles per second. If there is a slight difference in the shape and composition of two quantum systems, which are supposed to be identical, it will lead to a much smaller, but still significant, frequency mismatch. Due to these variations, the quantum systems produce photons with slightly different frequencies rather than exact replicas, which may be essential for the quantum communication network. According to the researchers, Qing Li, Marcelo Davanço and Kartik Srinivasan, these issues can be addressed with the new device, which is an illustration of nanophotonic engineering. 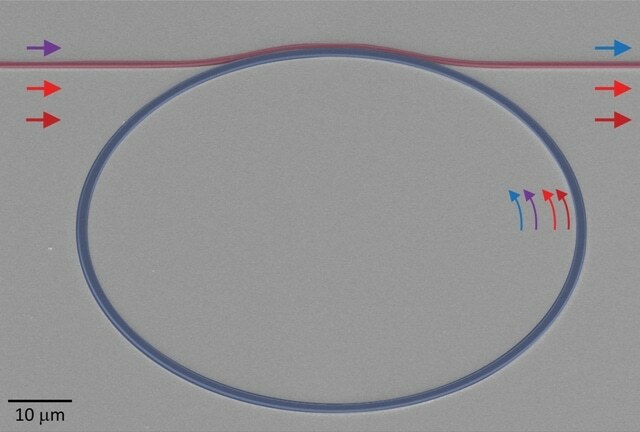 A tiny ring-shaped resonator with a thickness of a few tenths of 1 µm and a diameter of 80 µm is the key element of the chip-integrated device. Silicon nitride is the material used to make the ring, and its inherent properties are improved by the shape and dimensions of the ring in order to convert a photon from one frequency to the other. Two pump lasers operating at different frequencies drive the ring resonator. The frequency of an incoming photon into the ring is shifted by an amount that is equivalent to the variation in frequencies of the two pump lasers, using a scheme dubbed as four-wave-mixing Bragg scattering. Similar to performing cycling on a racetrack, the incoming photon rotates around the resonator multiple times before leaving. As a result, the device is able to efficiently shift the frequency of the photon with low background noise and power consumption. Earlier experiments consumed a few watts of power, however the newly developed device uses only one-hundredth of that value. The added amount of noise is small enough for future analysis involving single-photon sources. [While other techniques have been used for frequency conversion] nanophotonics has the benefit of potentially enabling the devices to be much smaller, easier to customize, lower power, and compatible with batch fabrication technology. Our work is a first demonstration of a nanophotonic technology suitable for this demanding task of quantum frequency conversion. Researchers at NIST's Center for Nanoscale Science and Technology performed this work.